Born: April 24, 1894, Stafford, Staffordshire, England. Died: January 25, 1972, Cornford House, Tunbridge Wells, Kent, England. Buried: Tunbridge Wells, Kent, England. Son of Thomas Houghton, Curate of Stafford, Frank attended the University of London (BA 1913) London College of Divinity (now St. John’s College, Nottingham, graduated 1914). He was ordained a deacon in 1917, and priest the next year. He served as Curate of St. Benedict’s, Liverpool (1917-9); All Saints, Preston (1919-20). Inspired by missionary Hudson Taylor’s example, he joined the China Inland Mission, serving at Liangshan (1920-21) and Suiting (1921-24 ). In 1923, he married Dorothy Cassels, daughter of Bishop Cassels of West China. In 1924, he became principal of the Theological College in Paoning, Sichuan. He returned to England for medical reasons in 1928, expecting to stay only a short time, but he stayed to edit China’s Millions. 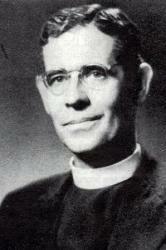 He also served as Examining Chaplain to the Bishop of West China (1928-36). He went on to serve as Consecrated Bishop of East Szechwan at Nanchung (1934-40); General Director of the China Inland Mission (1940-51); Vicar of New Milverton, Leamington Spa (1953-60); and Rector of St. Peter, Drayton, Oxford (1960-63). Houghton retired in 1963, and he and his wife lived in Parkstone, Poole.